Desert Shores is a planned community located in Las Vegas, Nevada. It is in the East part of Summerlin, NV. There are more than 3,000 homes, with many on the water front. Desert Shores is part of the 89128 zip code. We have real estate agents ready to help you find your dream home, sell your current home, or find a place to rent. Bordered by Summerlin and situated around stunning manmade lakes this beautifully designed community is a peaceful oasis only minutes away from downtown Las Vegas. If you are not particularly fond of the strip, there are miles of nature trails and plenty of activities for water enthusiasts as well. The beautifully designed houses and condos at Desert Shores Homes make this a place residents love to make a home in. Desert Shores Homes is bordered on two sides by Summerlin, which was named after Howard Hughes’ grandmother and has the distinction of being named one of the “best places to live in America” by Money magazine in 2014. It is a luxury community wiht manmade lakes that are designed to delight water lovers, along with providing welcome relief from the heat. The planned community has an estimated 3,500 homes that range in price and size, with some situated on the lake. Residents can choose between beautifully designed homes and condos, with some located in exclusive gated communities. Residences located on the water’s edge can be custom built to your exact specifications, and often include a private boat dock which also makes a great place to fish. With 700 acres that include lushly landscaped trails around the lake, the Desert Shores community is the perfect place to call home. Not only is the community of Desert Shores conveniently located close to downtown Las Vegas, residents can also take advantage of nearby Summerlin. Located across the street from Desert Shores is Summerlin’s scenic Pueblo Park, which many consider to be one of the best in the area. Residents don’t need to leave home if they want to spend the day outdoors or shopping at exclusive boutiques. The community center is open to all residents and features fine dining, unique shops, and a host of other amenities. The recreation area around the lakes will keep adults and children happily enjoying the fresh air for hours, while the BBQ and picnic spots are a great place to enjoy a meal outside. The manmade lakes are regularly stocked with game fish to keep anglers constantly hunting for their next “big catch”, and residents will also love being able to take their boats out on the water. Fish from the dock or out on your boat, and enjoy a variety of water sports. A smaller lagoon pool is perfect for children and residents who simply want to relax, and no outdoor recreational area is complete without a basketball court. For residents who want to go to the beach without leaving home, there is plenty of pristine sand for them to enjoy. There are also sand volleyball courts to complete your beach vacation at home. Other community amenities include a spa which is the perfect way to relax after a hard day at work or play, and residents can also take advantage of the Racquet Club and Mar-A-Lago which is conveniently located next to the condos. There are 8.5 miles of walking and biking trails located through the Desert Shores community, and residents can also delight in their nearest neighbors which happen to be graceful swans and ducks. 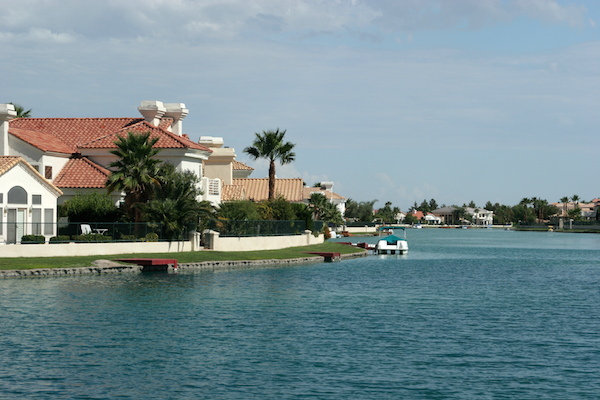 What type of residence are you looking for in the Desert Shores area? A 2 bedroom condo, a 3 bedroom single family home, or a 5,000 square foot luxury home with a pool and an indoor movie theater? It’s up to you, we can find anything. Our real estate agents have you covered! We would love to take you on a trip of Las Vegas and the various neighborhoods to find whatever type of home you are looking for.